As many of you know we have a 3 year-old little boy and just welcomed a sweet baby girl. So now you know where I have been lately. Our Little Guy has made the transition to a “Big Boy” room and at the same time he reluctantly gave up his nursery to his new little sis. What that meant for me was a chance to girlie-up the décor of the nursery before her arrival. For those of you that don’t remember, the room had been painted and decorated in blue, white and brown. These colors were actually what I had used in my office at our old Nashville, TN home, so I could see them being used for a girl, but decided I wanted some softer touches and a new look. Plus, after nearly three years of looking at all those circles I was ready to stare at something different for a while. This project began like most of mine, lots of ideas and no budget. Literally I was tasked with making something from nothing. 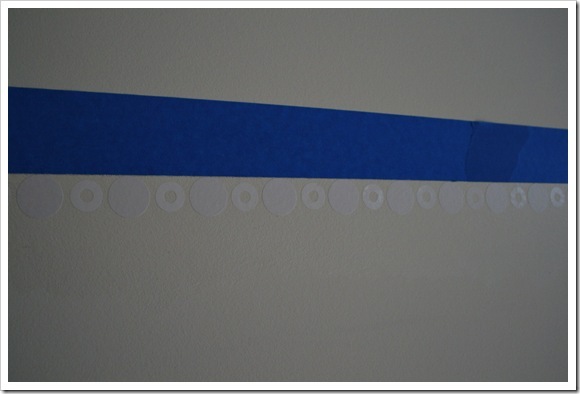 I decided the easiest way to neutralize the blue would be to tape off the center blue band along the walls and paint it out, which would also eliminate the circles and dots, but spare me the need to redo the entire room. In our paint stash I had a can of Oops paint from Home Depot that appeared to be a really pale misty blue-green, which although it may sound masculine, had a softness to it that seemed feminine and perfect to me. 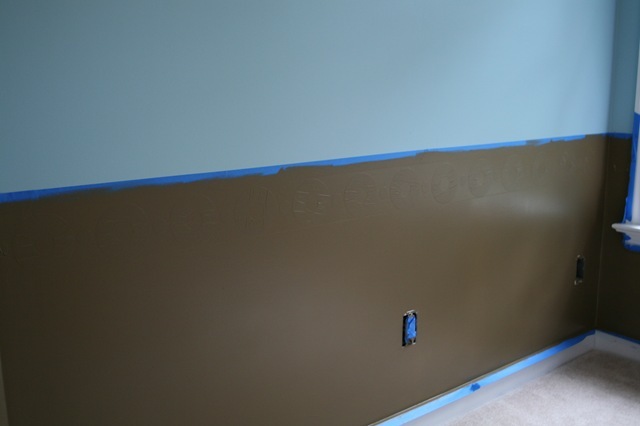 Unfortunately after taking the time to add the first coat it became abundantly clear that the color was more sage green in the room’s lighting and against the dark brown of the lower band. I was disappointed to say the least. Not only because the color looked so drastically different on the walls, but that this was the second or third time I had made this mistake recently and I no longer had the time to start playing the “find the perfect color” game. Originally I had intended to paint or stamp a pattern along the middle band, so in my mind I figured that might tone down the color, but no luck. So, in the end I sucked it up and realized I could not waste any more time worrying about the color and I just needed to move forward and learn to love it. It was a only a couple of days later, while rummaging through my fabric stash that I realized I had some pretty cute fabrics tucked away that could play well with the shade that ended up on the walls. So, I set to making curtains, covering pillows and creating some unique artwork. You can find more details about how I created the fabric pieces over at my sewing and craft site, Chic Tweaks. It was fun digging through my supplies to find vintage pieces to bring out and finally use and enjoy. Although, I am not a fan of making nurseries super gender specific I did have some favorite fabrics in a nice shade of pink that I thought I could make work with the otherwise neutral space. Even though the furniture is all quite modern I feel like the reproduction fabric prints (from the 1920’s- 1940’s) fit in just fine without being too over the top and cutesy. 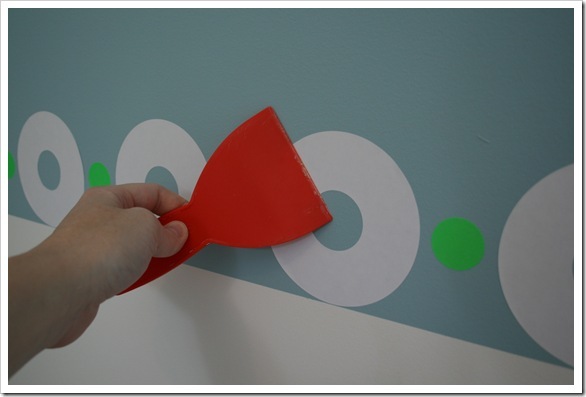 Just like in my son’s nursery, I personalized a wall mounted plaque with hooks by adding the new baby’s initials. As you can see from the shots above, we kept the placement of the shelf above the dresser/changing table, along with all the teddy bears. The bears were gifts from relatives to me and my brother when we were young. Now they have been sitting watch over my little ones. This time around I brought out a couple of the more girlie bears that didn’t seem right for my son’s nursery, but that I think our little girl will enjoy as she gets older. My aunt also sent us my mother’s Madame Alexander doll, which she had been keeping for all these years (at the very end of the teddy bear shelf above). The doll has been tucked in with the loyal teddies and I think goes well with a couple other vintage pieces in the space; namely the tan bear above which wears the dress my mom wore home from the hospital and the big brown bear who is wearing my mom’s Brownie Uniform from when she was just a girl. It’s fun to see all these sweet vintage mementos coming out from the attic to be enjoyed all over again. The little white rocker was a gift to my son from his Great Grandma and has since been confiscated back to his room. Jealous? Well, maybe just a bit. ;o) The sweet corduroy lion was my son’s gift to his baby sister. He likes to make sure she has it where ever she goes. So, I guess it’s not all hate around here. I will admit to having trouble bringing all my ideas together in this space. I finally decided to add everything I had in mind and just go from there. That is how the space ended up with a mix of vintage and modern, both in furniture and fabrics. Taking this attitude helped me find a better home for my sweet mounted butterfly picture from the ‘60’s, along with some metal flower hooks I have lugging around for years. And, for a couple more fun elements I hung a framed alphabet picture that ties in with the flowery garden theme and I strung up several paper lanterns left over from my son’s “big boy” room to act as a mobile above the crib. The lanterns were meant to be used for a shower (baby or bridal) and came with a bunch of paper butterflies to tape into place. I used all 24 of the butterflies to add interest to just three of the circles and I think they work pretty well for a mobile*. When I originally set out to write this post we were still playing the waiting game and I was sure she would be late. The pink frames are still awaiting shots of baby and grandparents and the hand-me-down toys and books are on high alert for their second chance at life outside the toy box. However, we have already worked our way through several boxes of the stocked up diapers, the dresser that was stuffed to the brim with pink, ruffles and lace has already undergone a weeding out of the too-small newborn items. After nearly two months of use I have to say that the look is growing on me just as fast as the closet is filling up with pretty little dresses all in a row. Now, if I could just get some sleep…..
*For those of you wondering, no, the paper lanterns are not meant to be used as a mobile over a baby’s crib. In order to avoid a possible choking hazard if the butterflies were to somehow fall off, I hung them at the bottom end of the crib. This way, if something should come down it will land below my daughter’s feet, and she still has a great view as they twirl around. PS – Here is the cost breakdown for you DIY nerds out there. Many items were reused from the original nursery and/or my vintage stash. Here is the list of those items. Bedding – quilt, bed skirt and bumper (not pictured) These items are pale blue on one side and white on the other. I choose to feature the white side for both the quilt and bumper, when it was in place. The bed skirt is neutral in brown and white. One is pink and green polka-dots and the other is a geometric pattern in pink. The vintage pins were from my stash, along with the mini canvas boards and ribbon. All fabric was from my vintage stash. Art was printed at home on cardstock I already owned. Not bad for a quick reworking of the original space and I think there is a lot of change in there for such a small amount of spending. Tell me what you think. I’d love to hear from you guys. 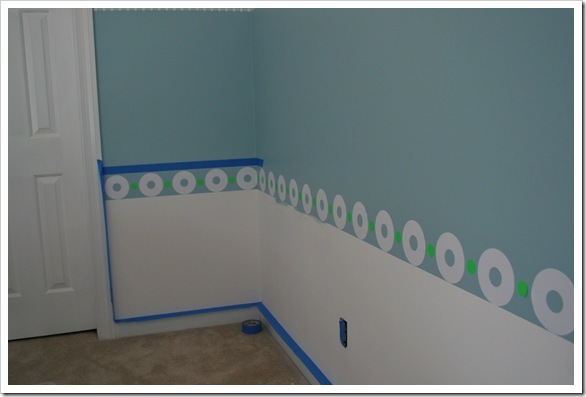 As I had mentioned in my novel long post regarding the nursery makeover I planned to share how I created the wall treatment. I bet most of you other DIYer’s out there figured it all out by now, but I still wanted to post a sort of tutorial on the topic. Like I said in the last nursery post I had very little time and almost no budget to make a big impact in this space. You may call it “Pregnancy Brain”, but the Little Guy’s arrival date was fast approaching and I simply could not think of anything very exciting to do. I finally got a flash of an idea while in an office supply store and decided I could make a couple of gallons of paint go a long way. 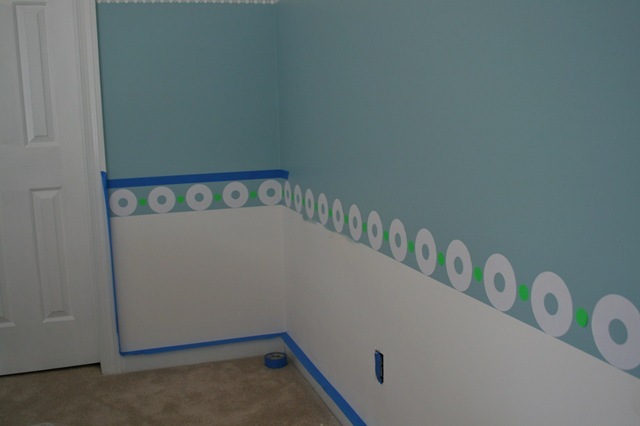 Hopefully, through infancy and into early childhood with a not-to-cutesy paint treatment for the walls. I knew I was going to stick with the brown and blue color scheme since it was still popular enough that I could easily find other accessories to fill out the room. With my tight deadline that was key. 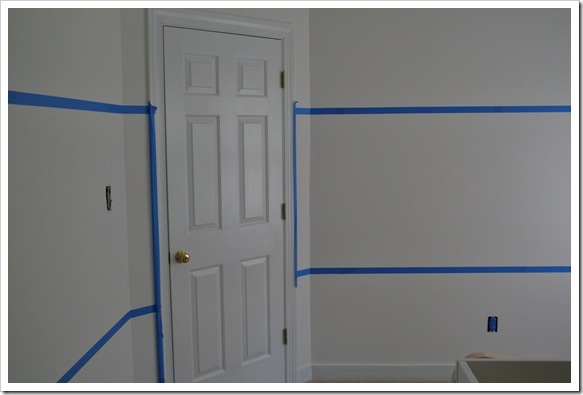 Since the room is fairly small I chose to make horizontal bands around the space to make it feel larger. Also, in order to help hide the wrath of a toddler I also used the darkest color along the bottom (ha! I am a genius!) ;o] So, here is how the plan played out…. First I measured the height of the bands and while using a level I lightly marked them with a pencil. 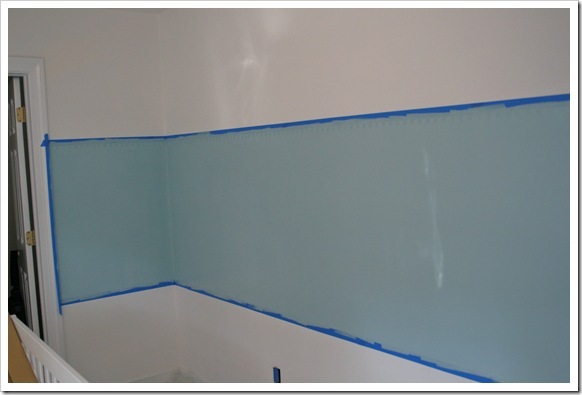 The walls were already white, but I had a few marks and holes to fill from the previous resident, so I ended up painting the upper portion a nice bright white to freshen everything up. In order to make my color transitions work from band to band I had to tape off and paint the center portion next. 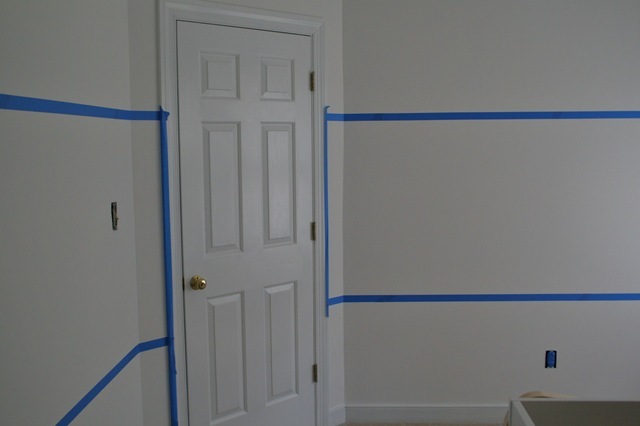 I used good old blue painter’s tape for this task. 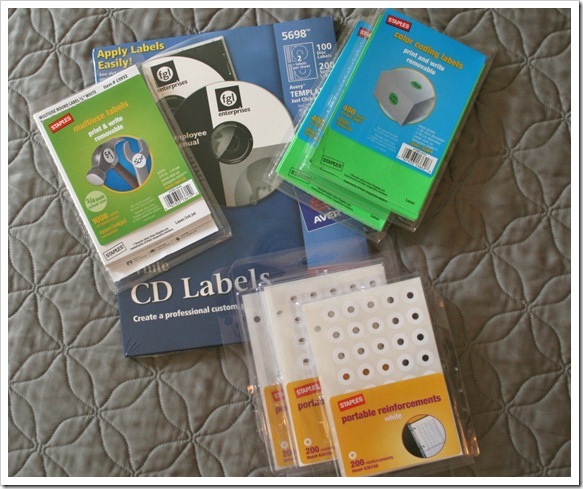 Then I collected my bounty from the office supply store for the next step. 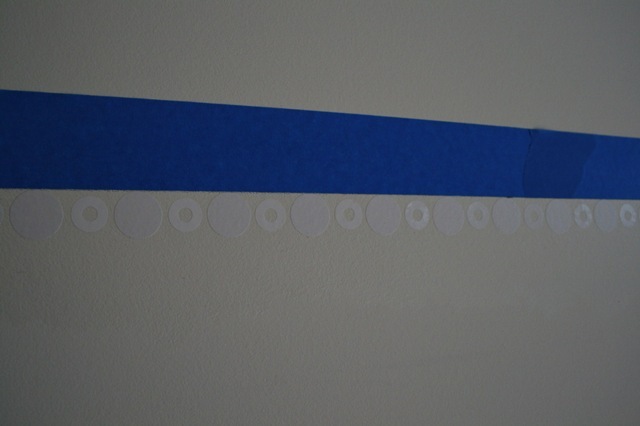 I placed them just below the painter’s tape line that separated the center band from the upper white band. In an attempt to try to keep the final coat of paint from seeping under the stickers and the painter’s tape I brushed on a basic gel medium, which is clear and helps to seal the edges. 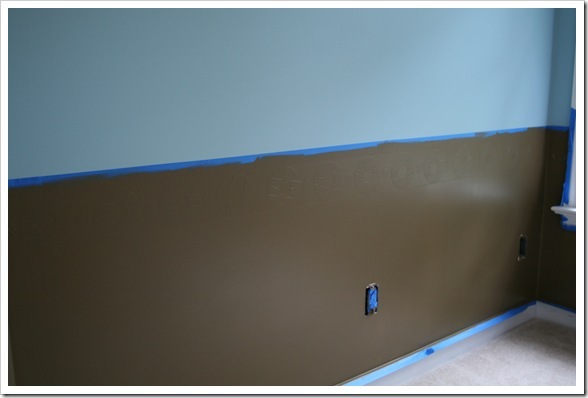 Then I rolled on two coats of BEHR Premium Plus in High Noon (color matched from a Valspar card) with an Eggshell finish. Since I was working on this in the dead of summer and the heat was almost unbearable the paint dried VERY quickly. That was great for the timeline and I was able to pull the painter’s tape and stickers off pretty quickly in order to get to the next step of the process….the bottom band. Just a note about these larger stickers: I stuck them to the leg of my pants prior to sticking them on the wall because the smaller stickers I used above left a bit of sticky residue when I removed them. I just wanted to avoid having large gray (dirty looking) circles and dots in the future because of dust, etc. Also, the gel medium made them pucker, so I had to just paint over the stickers very delicately to prevent seepage as much as possible. Again, it was hot, the windows and doors were wide open, and the paint dried very quickly. So, I was able to move on to peeling all those stickers off pretty soon after painting. Even with all my efforts to keep the final coats of paint from seeping under the stickers and tape I still had some touch-ups to do. Next time, instead of relying on a gel medium, I plan to just paint over the barrier with whatever color is underneath. That way the seepage won’t show later. Lesson learned. Of course I was pretty excited at how it turned out and hope that this simple paint treatment keeps the Little Guy happy for a long time. Or, at least until I decide I want to do something new to his space. Who knows!?! PS- One last note to those concerned about our health and safety during this process. Yes, I used regular paints rather than the super-eco-friendly no VOC variety, but I did so after speaking with my doctor about my plans. 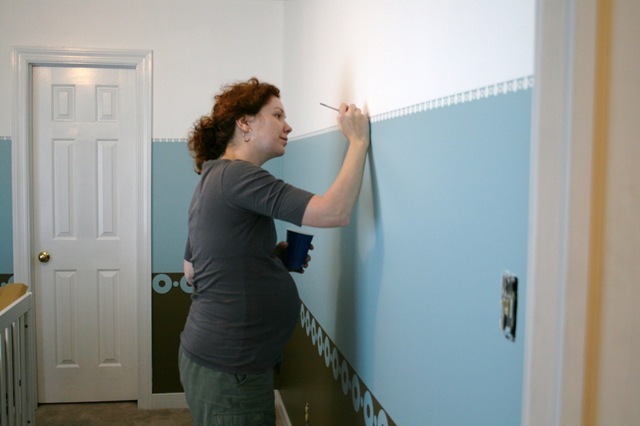 I also read up on doing DIY work while pregnant since I had a million projects to finish at our last home before moving to our new one. I wanted to be absolutely sure I was taking the correct precautions to avoid having a kid with an arm growing out of his forehead. As I mentioned above, the windows and door were wide open, plus I used a heavy duty respirator (which I refused to model in my touch-up shot purely out of vanity). Now that the Little Guy is almost five months old I am finally getting around to posting more info about how I decorated his nursery. I still have several projects under way to put the finishing touches on his room (probably just in time for him to move to a bigger space), but I thought I would go ahead and share what I have accomplished so far. For those of you that are new to Kitsch Designs here is a little recap: my husband and I just moved to Richmond, VA from Nashville, TN because his job was moved and we were relocated to this area. We left our beloved, funky 1960’s Tri-Level home and purchased a 1990’s Colonial in the ‘burbs. We were able to get much needed space, which I am slowly but surely revamping as time permits, and newer “bones” so to speak. (Nothing like the excitement of 3-prong outlets after having lived in older homes for the past 12 years!) We also made this move when I was approximately 7.5 months along and if it weren’t for the movers and my ABSOLUTELY WONDERFUL mom, I just don’t know how we would have managed. Since the baby was coming so soon after relocating my husband made me swear I would not start any major projects. I was only allowed to work on the nursery. Now, this may make you stop and think, “what kind of husband puts his foot down like that”? Well, the kind that has a super stressful job and dislikes large remodeling projects that create messes that linger for months. The poor guy has seen my past work and although he has always loved the outcome he has suffered, very vocally I might add, through the chaos that leads to the finished product. The Mister is handy, but just does not enjoy DIY projects like I do. So, I tread as lightly as possible with my “works in progress” and it helps to keep the sanity. So, to keep the peace that is exactly what I did with the nursery project. A shot from the hallway into the room toward the little walk-in closet. This shows the back wall of the room with the large and bright double window. Here is the room shot from the closet doorway looking toward the door to the hall. As you can see from these pictures the room was a blank canvas. In fact, the first time we viewed this home during the buying process I believe it had been set up for a boy because it was painted light blue and you can still see the remnants of that color on the trim peeking through the closet door in the first photo. The previous owners had painted the walls and trim white and left the plaid valance, which was also in shades of blue with cream and beige. The carpet is just a neutral beige and seems to be brand new, so we decided to leave it alone for now, plus it will be nice for the Little Guy to crawl around on in the near future. So, a wide open, empty space…that’s what I had to work with and I will tell you I think it made for one of the most difficult projects yet! For some reason when I am having to “make-do” in a tight space I always seem to know exactly what direction to move in, but with this room I was stumped. My head was reeling because I knew this baby was coming and I had to figure out what to do for furniture (buy new or refinish old), what to do for window treatments (off the shelf or hand sewn), what color or colors to put on the walls, trim, etc, etc. Like I said, my head was spinning! 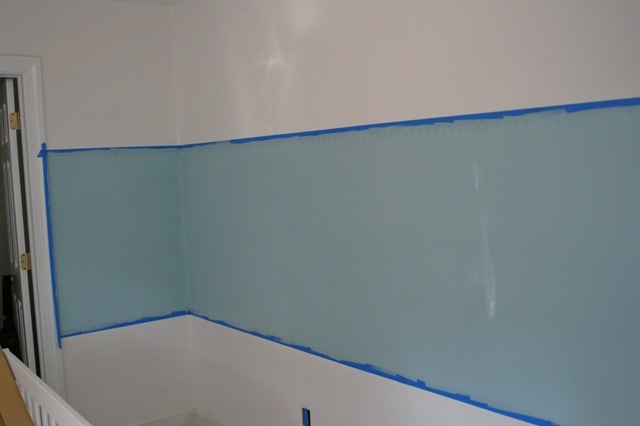 I finally decided that due to time and budget constraints I would have to make paint carry the room and I embarked on a project to liven up the walls with color. I also planned to purchase as many finished pieces for the room as possible, again due to the ticking clock that was my cooking baby. After finding a cute bedding set in pale blue and dark brown with a circular quilted motif things were set in motion. My goal was to do something fun with paint, yet keep the room from being to juvenile. The Mister and I were not really interested in having a specific theme or adding cartoon characters that the little one (or the grown-ups for that matter) would soon detest. Also, the last thing I wanted to do was create another painting project for myself just a few years later. I ran with the circle idea and got crafty with some supplies from my local office store. I will be posting more details about that project soon. Photo from the hallway door into the room. The resulting walls have a colorful horizontal banding that will not only hold-up to a soon to be messy little man (hence the dark bottom band), but hopefully grow with him a bit too. A shot of the room from the side opposite the hallway door. Here is the dresser that serves double duty as a changing table. We ended up purchasing a new crib to err on the side of safety and I spent the next several weeks searching local junk shops for the perfect changing table. At one really cool shop I found what I thought would be the most fantastic changing table and bookshelf. It was an old dining room hutch from the 1960’s or 70’s and the top portion of open shelving lifted right off the base, making it a great candidate for the bookshelf in the nursing and reading nook (pictured below). The remaining base had shelves behind two large doors, which flanked a center section of drawers and the top was just right for a changing pad and necessities. I figured a coat of shiny white paint to help it blend with the crib and we would be good to go. Unfortunately, when I returned the piece had just been purchased and carted away. Of course in my “baby is almost here!” nesting frenzy to get the work done I went into hysterics requiring a long soothing hug from The Mister as I commiserated about what I was going to do. I’m sure there are other women out there that have had similar meltdowns toward the end of their pregnancies and luckily we can look back now and just laugh about it. The nursing and reading nook. 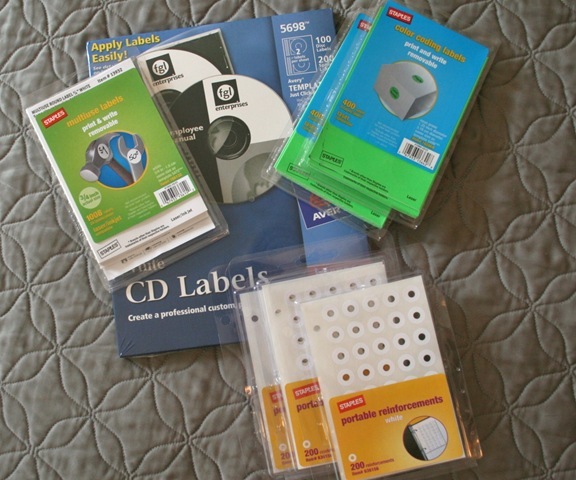 As you can see from the picture above we ended up with a simple white 3-shelf unit from Target. Although it was not a part of a nursery furniture set I thought it was generic enough to blend in well with the other pieces. 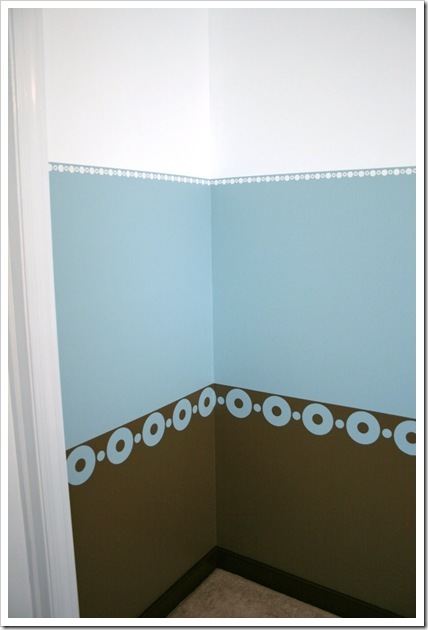 Plus, with a simple design like this it can be moved to other locations in our home and not seem like a remnant from the baby’s room. Speaking of remnants, don’t you recognize that lamp from this project? Yep, it’s making the rounds again! We topped the windows with a sturdy wooden rod and curved finial, threaded with dark chocolate brown tab valances. For now we kept the white honeycomb blinds, but plan to replace those with black-out roman shades later. My aunt gifted us the lovely bentwood rocker and we believe it fits in nicely. I tried to love a glider, but I just could not make it happen. I know they are super comfortable and there are times that I wish I was sitting down in a big plush chair, but for some reason manufacturers just cannot seem to get it right with glider design (or if they do it’s so out of this world in price you would need to take out a separate mortgage to cover the cost). This rocker fit the bill completely. I found it at Target.com, added it to the registry and was nicely surprised when it arrived a couple of weeks later. This is another piece that does not perfectly match the crib and dresser because it is a natural wood, but I believe the white webbing helps it to blend. I found the little bentwood table/stool at my local Kroger for $13.00 and figured I could not pass up a nice spot to place a drink or magazine while I am tending to the Little Guy. They actually sell these little tables at my local Target too, but for considerably more, so I definitely got a deal. (GO BUDGET!) One last thing about the rocker, it has have a very deep seat which is perfect for the Mister and I since we are quite tall, but for nursing I did add a couple of pillows to assist in sitting at a more upright angle. I just happened to find both of these at Walmart (ugh!) and the color combo was perfect. The neck roll pillow was just a regular bolster with drawstring bows on the ends. I tied the bows into loops that I hung around the top corners of the rocker. As you can see it worked amazingly well and keeps the kinks out of my neck during those early morning feedings. you can see that we have a full bumper, matching sheet and crib skirt. I really fell for this set from Walmart.com (really, again?) called Ticklicious because it was actually quilted rather than just printed with the circle design. Since I make and sell baby quilts as a side hobby my friends and family said they could not wait to see what I came up with for the nursery. It broke my heart a little to have to admit to them and myself that I simply did not have the time to sew anything with the baby coming so soon after moving. Once we received this set, though, I knew I had made the right decision. Each piece is of a very nice quality and the set includes not only the bumper, crib skirt and fitted crib sheet, but a set of toddler bed sheets and a fully quilted blanket that matches the bumper. This particular crib has a conversion piece included that transforms it into a toddler bed, so with one click of the mouse we were good to go for a while! We also mixed it up a bit by adding some of the Dwell Studio sheets at Target. I could not resist the super cute patterns in the Elephants bedding design. Once the little guy started to move around more I got paranoid about suffocation and pulled the bumper out. With the blue band of circles removed all the brown and white seemed overwhelming and I decided I liked the elephant patterned sheet with the blue and yellow peeking through to add some interest. After the fiasco with the junk store hutch and as time was running out, I broke down and bought the matching Olivia dresser to use as a changing table. Even though these pieces are part of a set they did not seem to over the top matchy-matchy to me. Plus I thought it was a nice touch the way they used simple circular cut-outs as drawer pulls. I never intended to bring a table specific to changing into the room and lucky for the Mister and I we are both tall. So, using a dresser with a changing pad on top has worked out very well for us. I also chose not to anchor the changing pad to the back of the dresser with the little flaps and screws that they include, however for safety I have placed a super sticky rub gripper under the pad and it works like a charm. As far as the other decor in the room, it was all just by accident and I am still working on that aspect of this space in order to bring it all together. The vintage globes and relief map ended up in this room because after we arrived we realized we had a small map collection going and the colors just meshed so well with this space. I am in the process of completing another wall art project with maps that will actually take the place of the relief map above the crib and I will share those photos once the project is finished. I knew I wanted a high shelf for our baby’s room, no matter what we were having, because I have a collection of heirloom teddy bears that I wanted to display. I also just completed the monogram hooks to add some interest above the changing table using the Jenn Ski Animal Alphabet cards. You can read more about that here. And, yes, that is a tiny skateboard leaning on the dresser. Don’t even get me started on that! The Mister is determined to have a little X-Games champ and is starting him out early. So, this is our Little Guy’s space. I had a lot of fun putting it together and I believe he feels quite comfortable in there. It is an ever-evolving space, not only from my personal decorating aesthetic, but with the Little Guy’s changing needs as well. I will be sure to share more details about the paint technique I used and other room details in the near future. 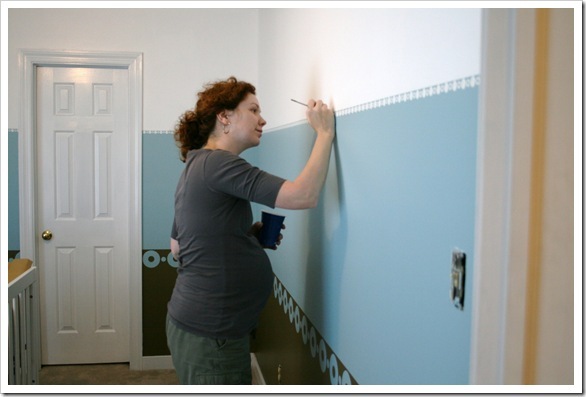 In the mean time, tell me about your nursery projects or other big remodeling plans you are working on. I am always looking for inspiration and my next project to tackle.